November, it seems, is upon us. With it, comes the change in weather, discolored leaves, and a whole gang of turkeys who have no idea what is coming. It also brings Charlie Brown movies, Christmas shopping, swapped recipes, and yes, yes, the Thanksgiving package and all that it entails. But this post is not about that. It is about the most insane marathon of prose to ever hit the writing world: National Novel Writing Month. While I am not participating in this year’s NaNoWriMo, I know many who are, and so I thought I would offer my own words of encouragement for Day 9. A few months ago, I auditioned for a play. 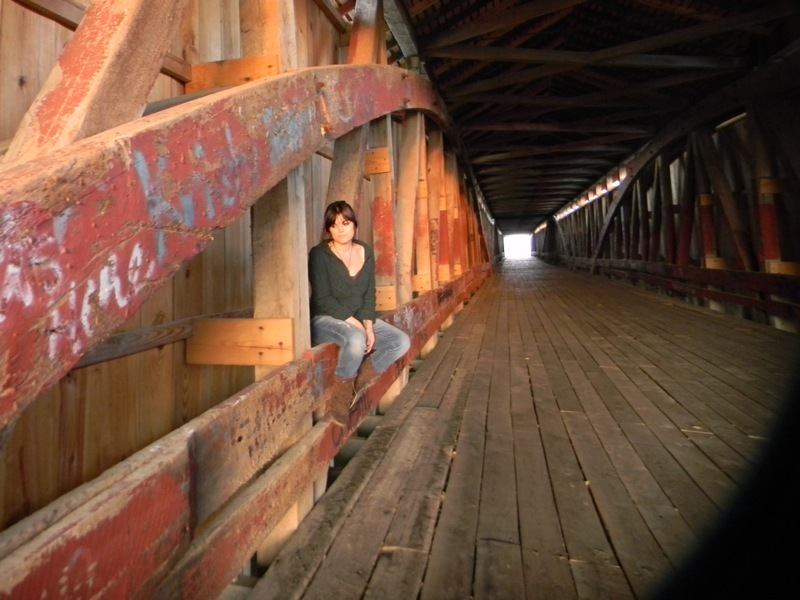 Since my last March post, I’ve moved from New Mexico to Indiana, where Randi is in her first year at IU’s MFA program. I’m working as an adjunct instructor, teaching four composition courses (3 preps) at two different schools (one in Bloomington; the other 45 miles north in Indianapolis). Adjunct pay is terrible, so I was also doing some freelance writing on my days off. As for my own work? Well, let’s just say that I carried my notebook with me everywhere, but rarely, if ever, did I crack it open. A month into the semester, I was feeling utterly depressed. The idea of writing made me angry. How dare everything get in my way? How dare the book sit beneath my desk, untouched and unpacked, the end only fifty or so revised pages away from being ready to shop to the world. Randi would tell me to just work, and I would mourn my time, as if it had died somehow and could never be resuscitated. Then, one day, when I was feeling particularly gloomy, I opened my inbox and saw a call for faculty members to join a student production. The play? 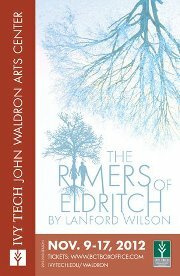 The Rimers of Eldritch. Rehearsals would meet every evening from 6-10pm and on most Saturdays. That was about a 20 hour a week obligation. The show would run for two weeks, and we would rehearse for six. Participating in this play, I thought, was probably the stupidest thing I could ever do. I barely had time to brush my teeth, why would I ever think that I would have room for something of this capacity? I did it anyway. I was feeling lost; I was in Indiana. Why not knock something off the old Bucket List? And here’s what I have to say about time. We hear the following: Life is short. Time is running out. There are not enough hours in the day. We have to prioritize. We have to sacrifice: Life is about one thing over the other. Have your cake, but for God’s sakes, don’t think you get to eat it, too. Here is what I wonder: Who started these rumors? Because that’s the best piece of fiction I’ve ever heard. Now before you cue the excuses, here’s what I have to say. There is time. There is a LOT of it. And there is space in your day to play, to write, to work, to love, to eat, and you can do those things over and over and over again. You just have to decide to take time. To make time work. It isn’t even about finding it. It is about OWNING it. DECIDING to SEE it. Embracing it, and Understanding it as well. Four classes, three jobs, stacks and stacks of papers to grade, classes to prepare for, not to mention the laundry, the dishes, the dinners, and the sleep. I added twenty hours a week to the mix with this production, and I still had time to write this post. I still had time to sit around and take long walks and apply for jobs. I had time for Grey’s Anatomy, and Revenge, and even watched two full seasons of The Walking Dead in forty-eight hours. Plus, I followed this election so closely I felt like I could have become a political consultant. I’m talking hours upon hours of reading news stories and watching pundits, and reading Facebook status updates, and pouring over footage of the debates, and sharing blog posts about Big Bird, and monitoring polls as if they were horse races. And I haven’t even brought up my family and the time I dedicated to them. When I look back on the last six weeks, I realize, that even with things as full as they were, I still had time to write. I just didn’t use it. And yes, this is me. And yes, you might say that I know nothing about your life and what you are going through and your time constraints–and you’d be right. I don’t know those things. All I’m saying is that for just a moment, imagine that I am right, too. Imagine you have all the time you need in the world. Imagine it is only up to you to acknowledge and use it. wonderful, wonderful post! and so timely. Today I started the long process of editing my 200 page manuscript. It’s ugly. It’s scary. My ego is on the line because it’s some of my best work and I have a hard time “killing my darlings.” I got far in the cafe today but I have so far to go. I have been putting this off due to “no time.” Thanks for the nudge! Thanks, Ann. I wonder if we would feel better about it, if we called it “putting our darlings in a storage container”? 🙂 I hope your writing is going well. Beautiful post! I’m thrilled that you are in a play (that’s on my bucket list too), but so sorry that you are stuck in Indiana. It’s only temporary. On a happier note, you inspired me to post to my own blog, which has been neglected of late. Then I need to work with Jenn on DimeStories. And then, at last, my book…. Thanks, Cynthia. I am so glad that you are getting some things done! Also, that Jenn…speak about accomplishing a LOT! She and I are working on something, too!!! YES we need to finish up that DimeStories thing…. and Sam: we’re making progress!